On the last day before the August recess, the Senate confirmed 65 of President Donald Trump’s nominees with a single bipartisan voice vote. 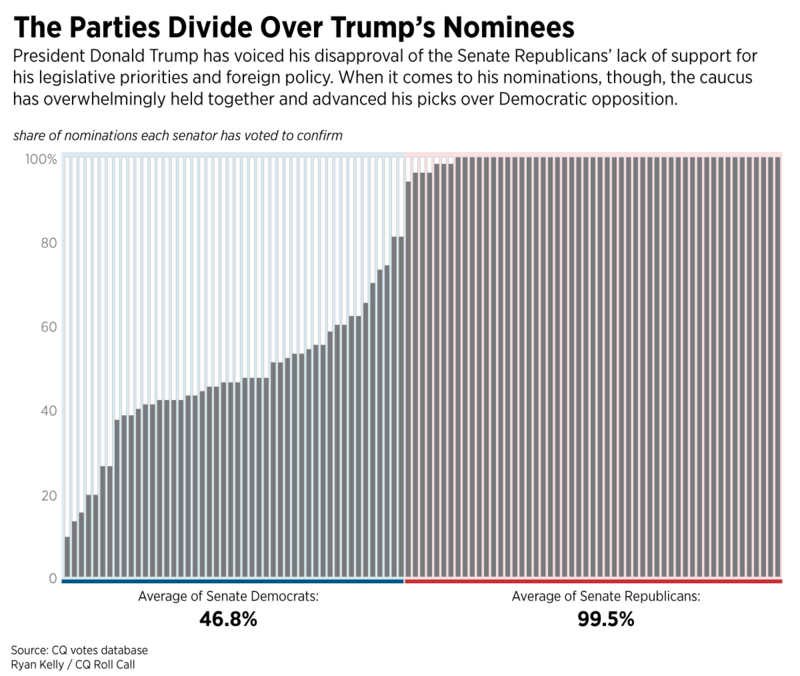 That has been a marked difference from the way Democratic senators have approached Trump’s picks for his team. Sen. Kirsten Gillibrand of New York leads her colleagues in opposition to the president’s nominees, casting recorded votes for only five of 53 of them, according to a Roll Call analysis. Her votes stand in contrast to her home state’s senior senator and the chamber’s Democratic leader, Charles E. Schumer, who has supported 20 of the Trump picks who have received a roll call vote. At the start of the year, Schumer made it clear that opposition to Trump&apos;s nominees would be supported by Democratic leadership. He even went so far as to upset his Republican counterpart, Mitch McConnell of Kentucky, by voting against the majority leader’s wife, Elaine Chao, a relatively uncontroversial pick to run Trump’s Department of Transportation. 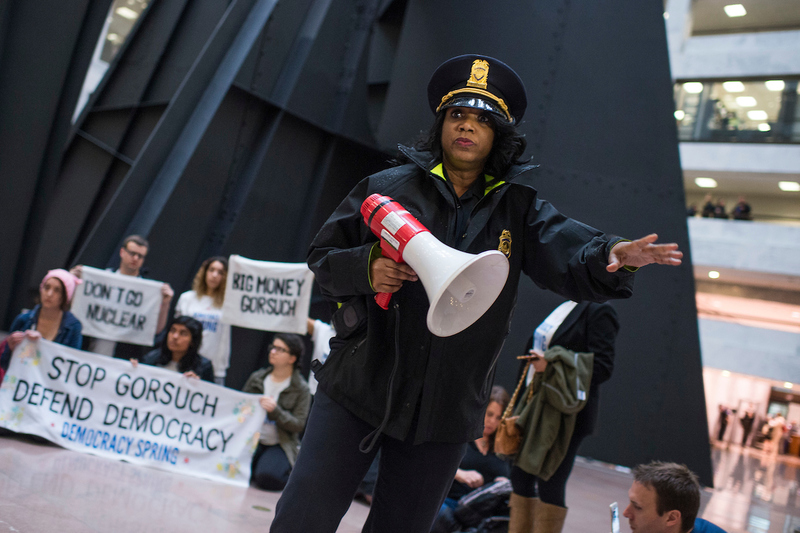 The resistance from Democrats stems from years of fights trying to seat President Barack Obama’s nominees, culminating in last year’s GOP blockade of Judge Merrick Garland’s nomination to the Supreme Court. Nathan L. Gonzales of Inside Elections suggested there is a common theme with this list since the top five Democratic resisters have been frequently mentioned as potential 2020 presidential candidates. “It’s not a secret that more than a handful of Democratic senators believe they can be a better president than President Trump. But they’ll have to navigate a competitive primary first, and being known as the chief opponent of Trump could be an asset,” Gonzales told Roll Call. The Democratic senators opposing Trump’s nominees could be reacting to pressure from liberal groups, angered by the unexpected loss of the White House. Faced with Trump nominees who were openly hostile to the departments and agencies they were now slated to lead, and with the president’s senior adviser Steve Bannon stating that the administration’s goal was the “deconstruction of the administrative state,” many Senate Democrats were happy to oblige. For those Democrats running for re-election in states Trump won overwhelmingly last fall, opposition has been doled out more judiciously. West Virginia’s Joe Manchin III and North Dakota’s Heidi Heitkamp both voted in support on 81 percent of the 53 roll call confirmation votes.